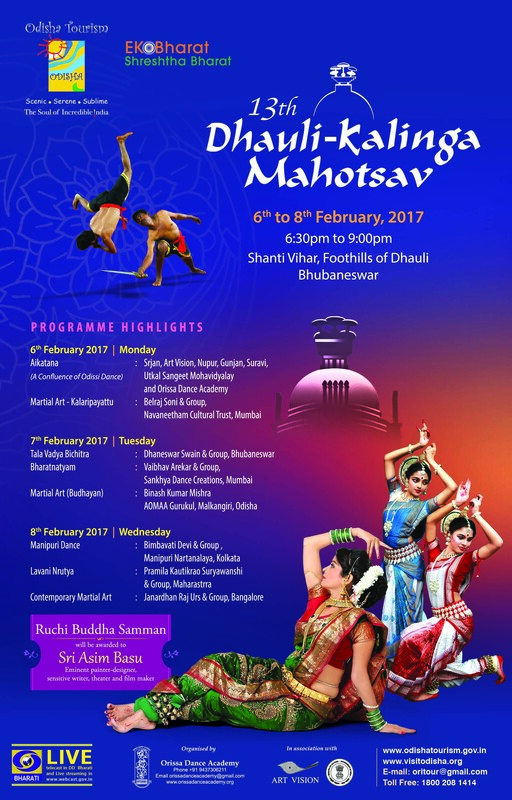 Organized since 2003 in association with Orissa Dance Academy, on the foot hills of the heritage site, Dhauli, the Mahotsav, has created a place for itself in the cultural map of the country. Hosting nearly 500 artists from across India, the Mahotsav stands apart as one of the most prestigious and diverse festivals to be held in Odisha. As a Buddhist heritage site, Dhauli serves as an ideal place for celebrating India’s legacy of cultural coexistence and we take great pride in promoting its tourist potential. The aim in organising this mahotsav is to keep alive the ancient culture and create awareness amongst the young generation. The objective is to preserve, promote and popularize the heritage at the national and international level. Under the auspices of Dhauli’s rich historical and spiritual base, attempt is made to bring together artists of diverse disciplines in the spirit of cultural solidarity. The ambience is enchanting, performances enthralling and the atmosphere encompassing, a true presentation of artistic excellence.